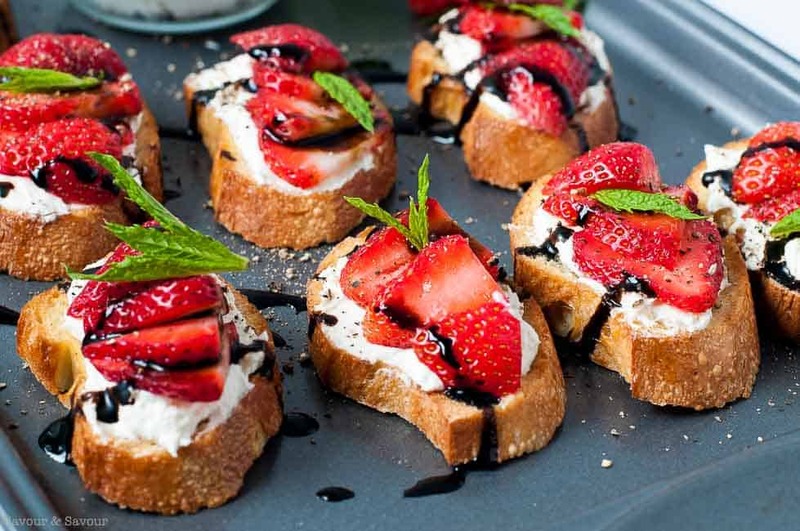 Fluffy whipped cheese and fresh sweet strawberries on a tiny toast make a tasty appetizer. 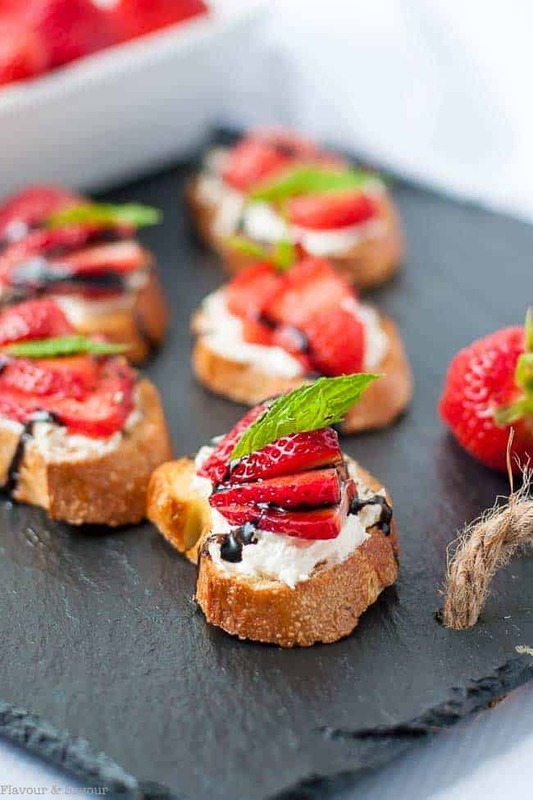 This Whipped Feta Crostini, topped with luscious strawberries and mint right out of my garden is too good not to share. 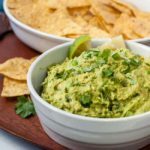 I know I have a lot of crostini recipes here on Flavour and Savour, but I simply had to include just one more! Crostini means “little toasts” in Italian. 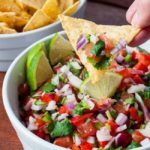 If you love easy appetizers like I do, you may want to check my recipe index for Crostini Appetizers. 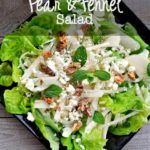 You’ll find a dozen choices, including some topped with ricotta, blue cheese, goat cheese, cheddar, burrata and more. 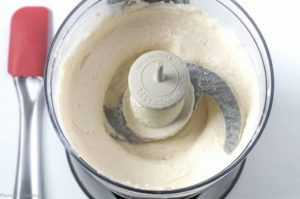 And if you want to avoid the pitfalls and make perfect crostini every time, read 5 Tips for Making Crostini. 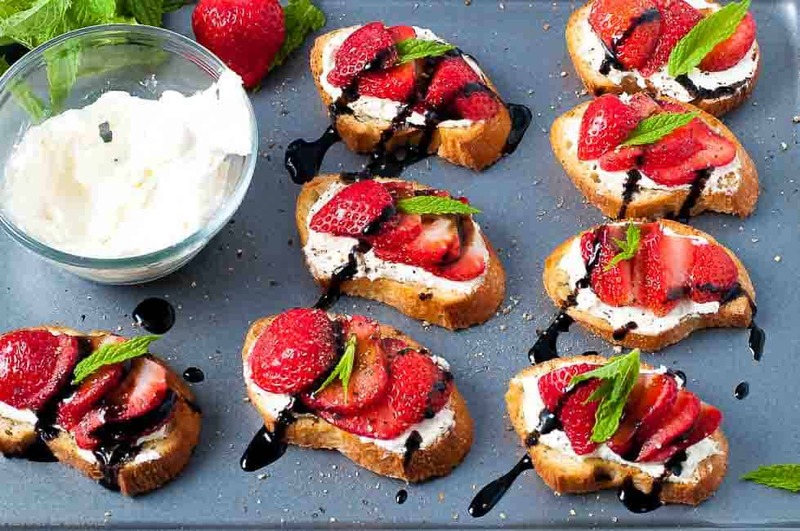 With fresh strawberries in local markets, and berries ripening in the garden, adding them to a tiny toast topped with whipped feta and cream cheese seemed like a great way to enjoy them. And drizzling them with a little honey and balsamic glaze intensified their flavour even more. Slice your favourite baguette: sourdough, multigrain, spelt or gluten-free, then brush with a little olive oil and toast in the oven until golden brown, crisp on the outside but still tender . 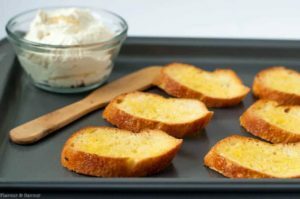 Whip equal parts of feta cheese and light cream cheese together and spread on the cooled crostini. Then top with thinly sliced strawberries, gently pressing into the cheese so they don’t fall off. Next, drizzle with a little honey and some balsamic glaze. And finally, add a fresh mint leaf (or basil if you don’t have mint.) Serve and devour! 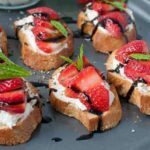 Fluffy whipped feta cheese smeared on a thin toasted baguette and topped with fresh strawberries and balsamic drizzle makes a tasty (and popular) appetizer. Slice baguette, brush lightly with olive oil and bake at 375°F for 7 - 8 minutes, turning over halfway through until golden brown. Cool completely. Mix feta cheese and cream cheese in a food processor until smooth. Spread on each of the crostini. Slice strawberries and arrange on top of whipped cheese mixture. Sprinkle lightly with black pepper, drizzle with honey and balsamic glaze. Serve immediately. 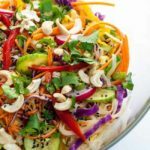 Use store bought balsamic glaze, or make your own. Mix 1 cup quality balsamic vinegar with 1/4 cup brown sugar in a medium saucepan. Bring to a boil, then simmer until reduced by half, about 20 minutes. Cool and store in a covered jar in the refrigerator. Gosh! Do not apologize for one more crostini recipe – this one is a keeper! They looks delicious and adorable, too! Thanks Denise! I always seem to include at least one type of crostini when I make an appetizer tray, so it’s great to have lots of choices!